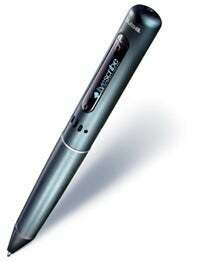 "Unique" is one of the most overused words in tech, but it's the only way to describe Livescribe's Pulse smartpen. Depending on how you look at it, it's an voice recorder that can also take notes, and then lets synchronize them and upload them to a computer for later reference. Or maybe it's a note-taker that also records audio. Or a tablet PC without the tablet and PC parts. Whatever Pulse is, it just became more versatile and customizable. Livescribe launched an application store today, one that's very much in the spirit of the iPhone App Store. Available through the Pulse's desktop software (which runs on PCs and Macs), it's a repository for programs-mostly free or cheap ones-that extend the usefulness of the pen. Buy one and sync your phone via its USB dock, and it gets downloaded to the pen. The Livescribe app store is starting small, with thirty apps. 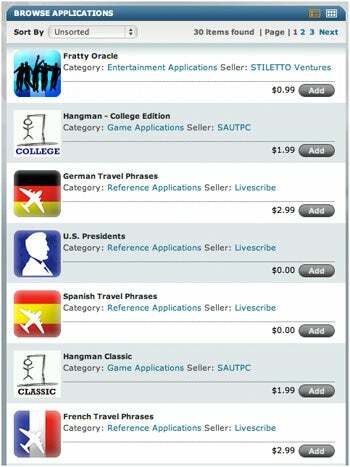 They include language tools (such as Japanese Travel Phrases), games (Hangman! ), and reference works (a guide to the U.S. presidents-or as much about them as it makes sense to read off the tiny display on the Pulse's barrel.) Using a pen loaned to me by Livescribe, I used and liked a English-Spanish dictionary that uses the Pulse's handwriting-recognition feature to let you write words you'd like to be translated, and a helicopter game that reminded me of a 1980s arcade-game side scroller such as Defender. Almost everything in the store is $2.99 or less, but there's one notable exception: Magic Yad, an app designed to help kids study the Torah for their Bar or Bat Mitzah. You use it with Torah passages printed on Livescribe's special paper, which is imprinted with a faint grid that helps the pen keep track of where it is on the page. Click a passage, and Pulse reads it out loud over the Pulse's built-in speaker. Magic Yad costs $99.99, which is presumably cheaper than hiring a tutor.